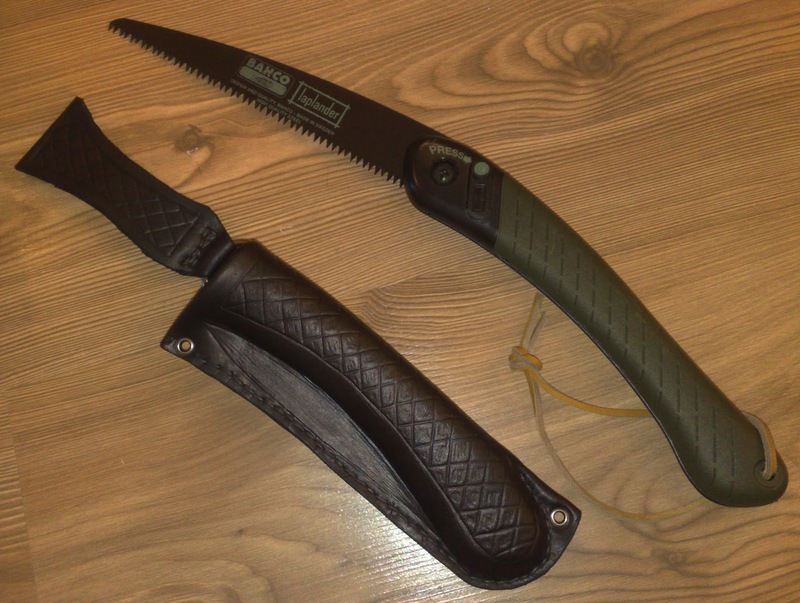 So i have received the second prototype of Seikku´s brutal bush "knife". 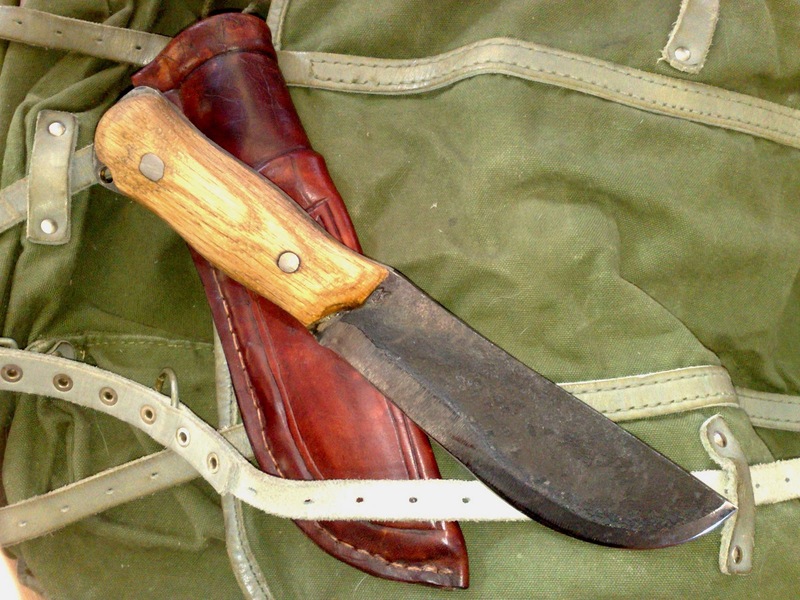 Its something between leuku and campknife,axe and whet ever but man i do like it ! 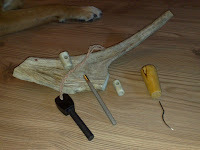 Ive already chopped quite a bit with it and whittled some fire starting sticks and shavings, cleaned some bush and all sorts of chores. 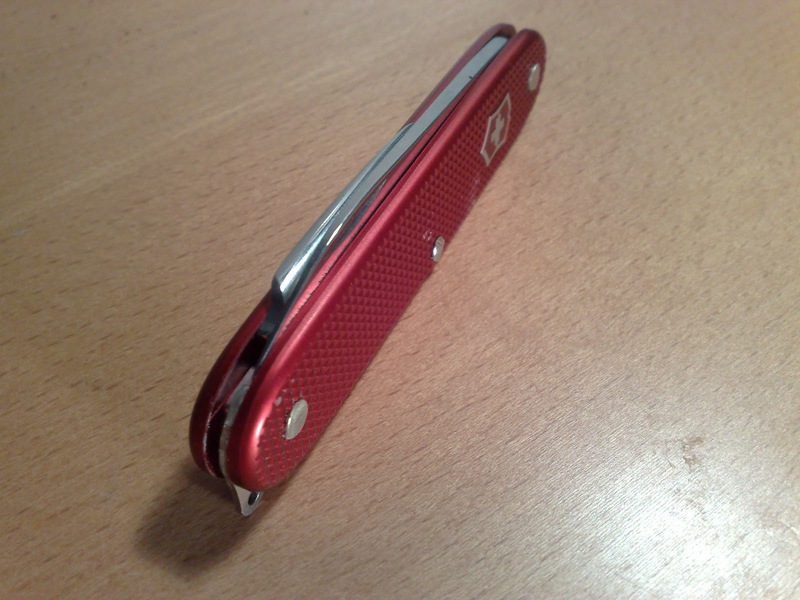 It has a good mass and seems to stay sharp for a long time. Well, ill be using this more ant tell you more,but already you can order yours,too. With this type of tool you arent paying for over priced hunk of steel thats only ground from blank, no man, this has been forged and forging makes miracles to insides of steels. No mosaic pins to rise up the price,no exotic steels,no rare wood species, just business for hard use. So,i ´ve been bit on flu and fever but i cant stay put, i just have to craft a little. Todays condition allowed me to craft this leather belt sheath for my folding saw. Yep,its back in black, again, sorry folks. 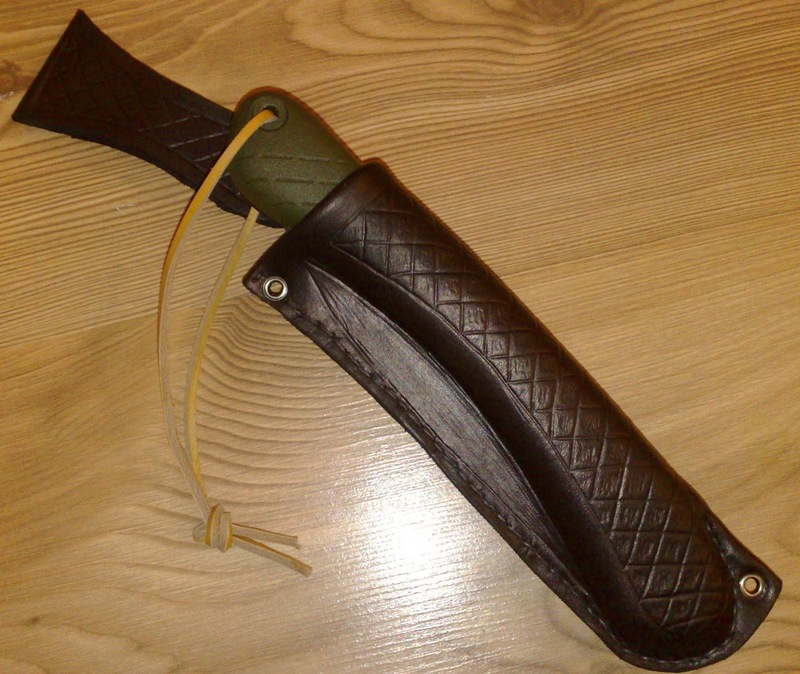 I just know that most of my other belt carry sheaths and pouches are mostly in black leather so this fits in with em on the belt just nicely, i think. 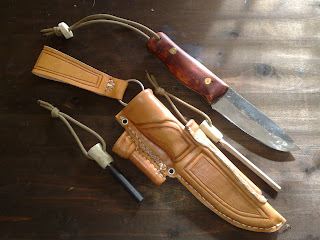 Sheath project done, with firesteel and sharpener added. So heres the sheath for the knife i mentioned couple posts before,the one originally forged by Ilkka Seikku and finished and re-ground by myself. 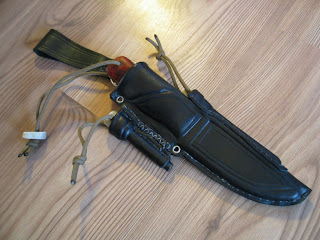 I wanted to add a few functions to the sheath. The first thing was to fabricate two reindeer antler handles. 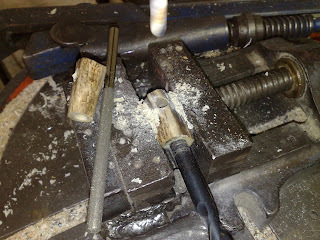 The other would be for Light My Fire´s thick Army firesteel and the other i made for the diamond sharpening rod. I had a Marttiini´s retractable pen shaped diamond rod, so i just got rid off the excess parts of it and kept the rod itself. In the picture above its in its original length but i took over an inch off from the tail of it to keep it properly short sized. 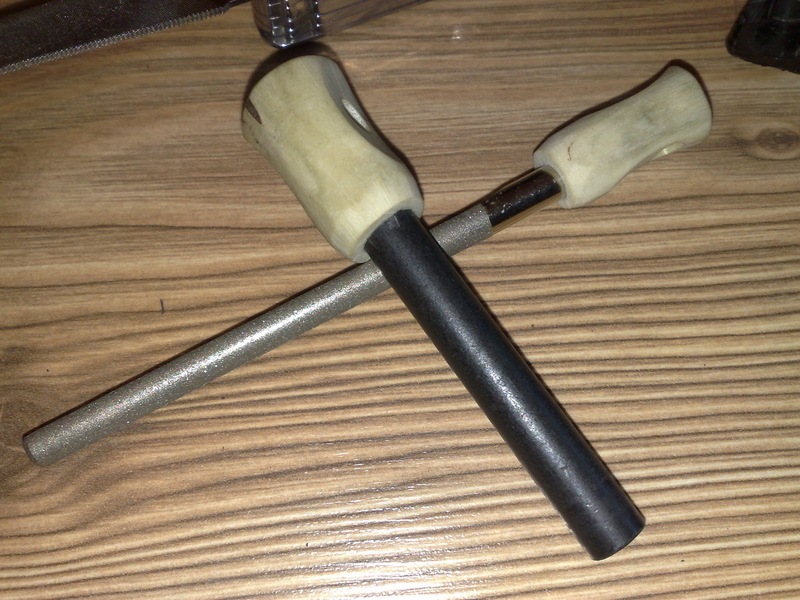 Heres the handle for sharpener an the shortened rod itself. Its deep and has a good "click" when the knife locks in the sheath. I made the beltloop as dangler type and its large enough to slip over sami belts as well as US army type of duty belts etc. 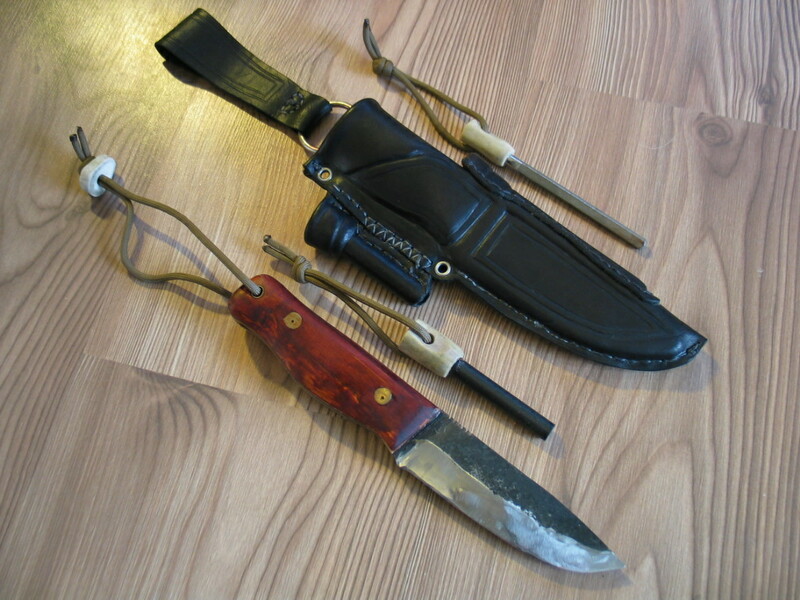 The diamond sharpener is in the spine-side of the sheath and the firesteel...well youll see where it goes. What do you think ? Id say its practical if not pretty and practical goes always over the looks in my books. 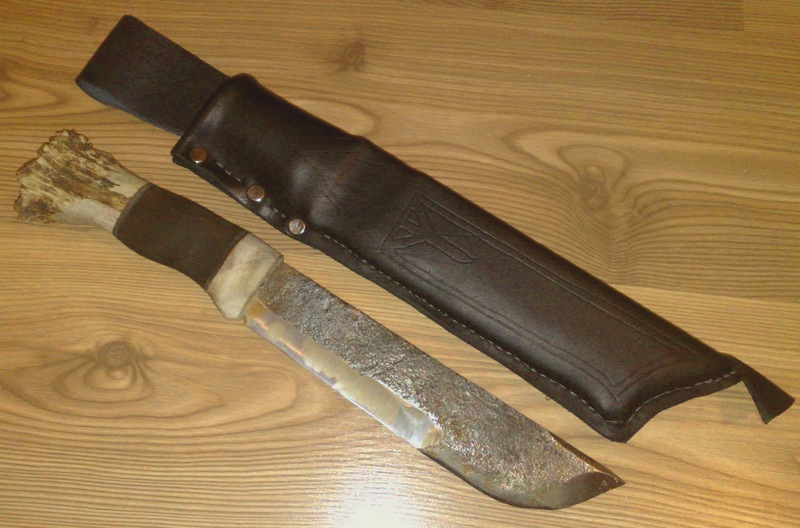 So here it is, my crude new working mans leuku. What do you think about it ? I already had a go with it,and it whittles ok and seems sturdy, plus the long and heavy handle fits my hand, its made quite long as you see,so i can have gloves on and use it,at winter. Ill be adding one or two cross drilled pins between handle parts and tang and put in a leather wrist lanyard too, soon, but its ready to go already and im about to use it for next weekends hike & cabin trip. Sheath i did pretty fast too,it has a sturdy wooden liner and a large belt loop so i can slip it over duty belt. Its just a piece of leather that was left in shops floor so its all scratched already,i just stitches and cut it,stamped a few rivets, and dyed it black and rubbed some Grangers G-Wax on it. I think its ok. 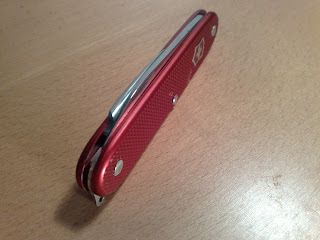 I saw one blog story last night about modified , limited edition custom Victorinox here. 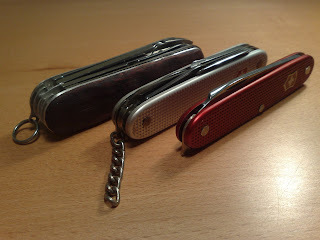 So i wanted to show you my own self made Vic´s, scraped together from various models. As these are for actual personel use,and the rivets arent the nicests jobs, but these are workhorses,not showcase items. They have marks from life in the trail and tehy dont have any collectible value but theyre nice little gadgets to my personal taste. 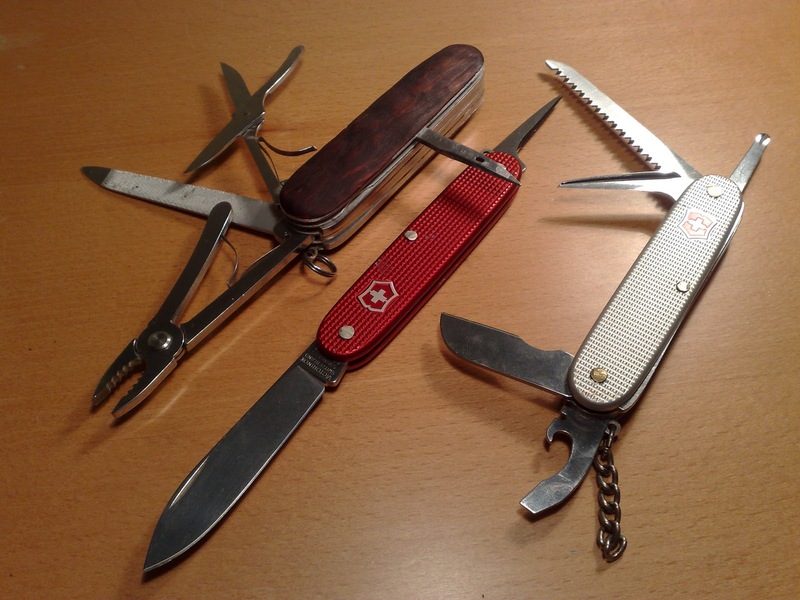 First one is the simplified Alox with just a single,plain blade and an ever useful awl, which i find to be about the nicest design,compared to any other folding knives awl,as it folds out from the knives end, not from backside and middle,like it does on the plastic handled Vics etc. Its actually made from Farmer model that had a broken saw implement that i took off after removing the riveted pins and the first layer that had the quite useless openers with flathead screwdrivers that i rarely use. 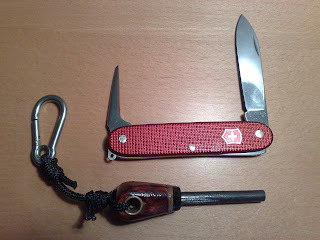 Second one this time is bit larger Alox based. Its done from Electrician model wreck if i remember right. I like that chisel ground small blade thats good for delicate and accurate carving, so its the only blade found in this one,as i normally tend to use a real fixed blade knife with me, so in this,the basic blade would mean just excess thickness and bulky tool. 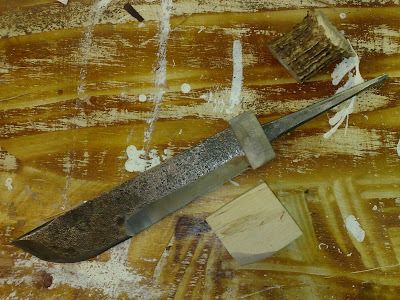 Awl is in the same layer with the small blade. 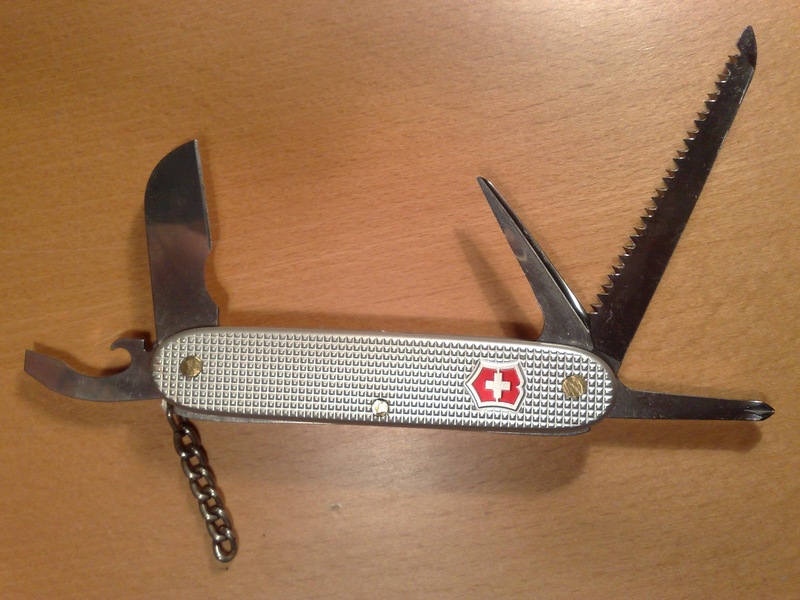 Then on the next layer there´s the saw, an implement that i find the most used with the awl and on Victorinox, its quite powerful to be such small sized and it lasts long. And on the last layer theres the combo tool, having both,the can and the bottle opener in one single tool,as well as middle sized flathead. 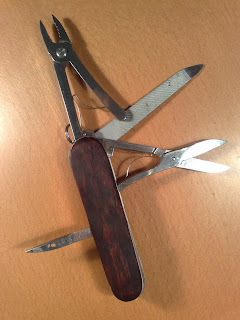 This is the best opener in small sized Vic´s. 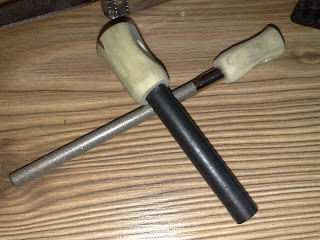 With the combo tool theres the phillips screwdriver,modified from some plastic handle Vic. This kind of mixing takes little more effort as you may have to fabricate spacers from brass or similar,in different thicknesses, grind and polish teh backsprings etc but its still REALLy difficult at all. Patience is a virtue. The last one this time ( i have several modified folding knives,Alox Vic´s with pliers and such ) is my crude Vic, living in my repair kit nowadays. It has just an awl on the back,not any stupid winebottle openers. Id rather see phllips driver on the place of that. 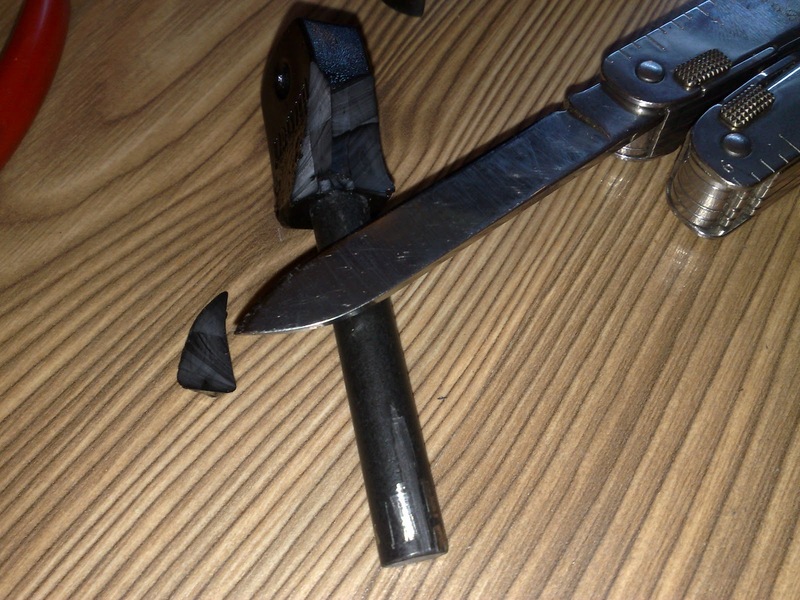 Then theres a file,saw,scissors and small pliers,tough enough to help in gear repair, or bending twisted hooks etc. 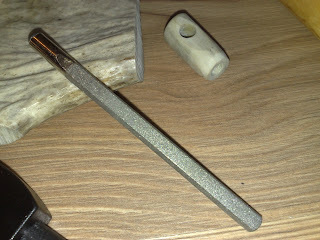 The handles are made from small leftover curly birch, that i just dyed and waxed,theyre put in place for good, with epoxy and no,they dont have those easy dropping and then missing tweezers and toothpick :).